Using Amazon as my reselling marketplace of choice is a no brainer. The fact that I can simply add a label to my already packaged product, ship it off to Amazon, and wait for my payment to come in, is a beautiful thing. It makes reselling a breeze. However, that isn’t to say it’s all rainbows and butterflies. There are a lot more fees and a lot more returns, but the time savings and the simplicity make up for the downfalls. If you’re new to the world of reselling, this is a great post to start with. 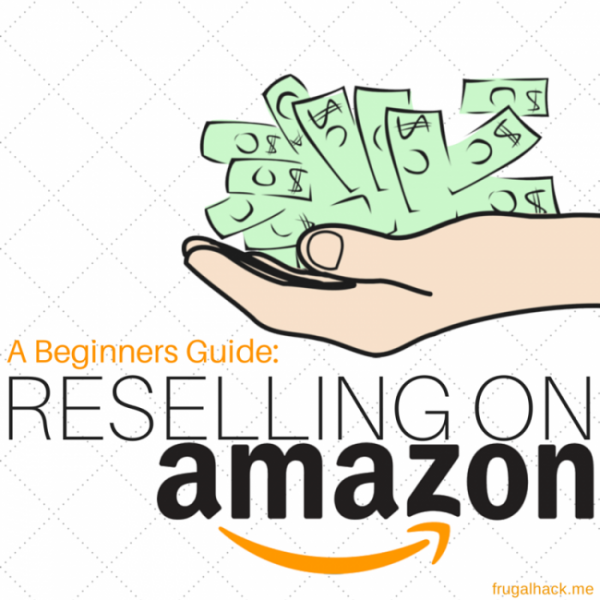 I will be going over the basics of reselling on Amazon, why it’s a great marketplace, and what to watch out for. So, don’t worry if you’re completely new at this, you’ll be an expert before too long. After reading this guide, I highly suggest looking at my other reselling guides below. Reselling: Companion Pass Edition – This is a subscriber only post. Please sign-up for the mailing list to read this post. Head to Amazon and set up your seller account. If you already have an Amazon account, you can link them on this page as well. There are two types of seller accounts, Professional and Individual. The main difference between the two is that Professional sellers pay a $39.99 monthly fee and Individual sellers pay a $0.99 per item fee. So, if you plan on selling 40+ items per month sign-up as a Professional, otherwise sign-up as an Individual. You can switch between the two at any time, so I would suggest starting as an Individual until you get the hang of it all. 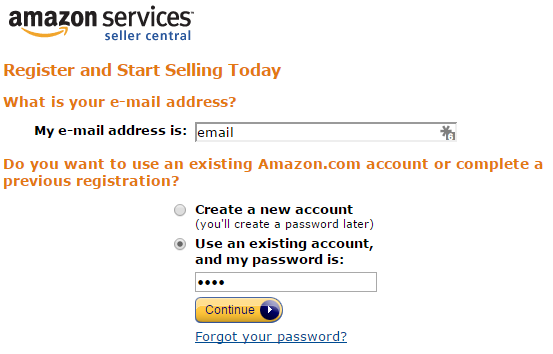 Once you select which seller account you want, you can sign-up with your Amazon account or create a new one. Enter your legal name or business names and accept the terms. Finish entering your business information, add a credit card, and you’ll end up on the seller page (seen below). This is the main screen you’ll see every time you login. The important sections are numbered. This section shows your seller performance. It shows your reviews, your seller rating, and your account health. If you use FBA, chances are you’ll always be at a 100 rating. You likely won’t have many reviews even after selling for a while, because not many people leave them, but realistically they should always be 5 stars. This section shows how many items you’ve shipped and Amazon has shipped in the last week. This is just a snapshot, so if you want to see more, click the numbers. This section shows the pending balance that Amazon owes you. Amazon pays out every 2 weeks, so it can take a while to receive your money. As you can see, there are a lot of pros to selling on Amazon, but there are almost as many cons. Do you want to provide your own customer service or are you willing to pay a bit more and have it provided for you? 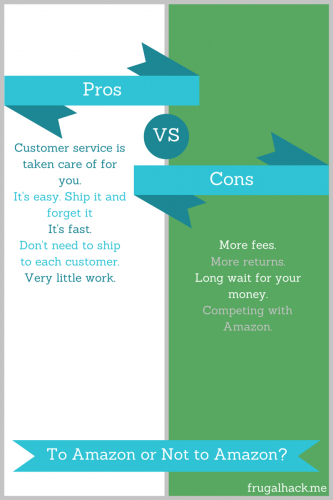 Do you want to ship every item you sell or is it more cost-effective to give the work to Amazon? It’s important to look at your selling goals and see if reselling on Amazon is right for you. The main part of a listing is shown above. To a buyer this has a lot of information, but to a seller the only parts that matter are the “Buy Box” and who is selling the product. 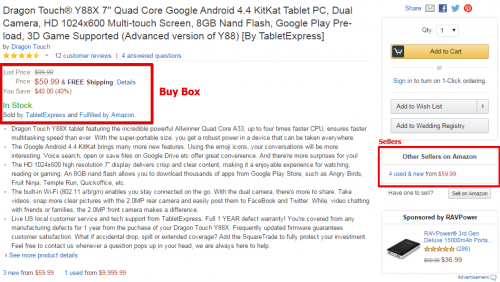 The Buy Box is the part of the listing that shows what the price is when you click “Add to Cart.” The Buy Box seller is not always the cheapest, nor do they always use FBA. Amazon has an algorithm that decides who stays in the Buy Box. If you have the cheapest price and ship via FBA with a rank of 100, chances are you’ll have the Buy Box. 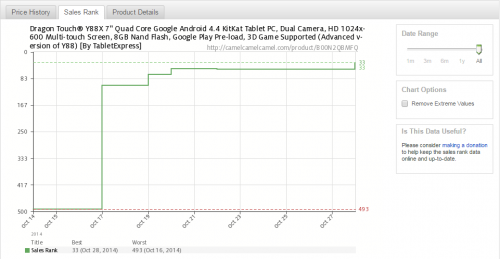 On the other hand, If Amazon sells the item, they will always have the Buy Box regardless of price. Jordan mentioned in the comments that Amazon doesn’t always have the Buy Box. If you price an item 1%+ less than Amazon, you will win the Box. If Amazon does sell the item, you may have a tough competing with them. They will almost always beat your price even if you change it regularly. The best thing you can hope for is that they go out of stock at some point. For popular items, this happens often. I generally try to sell items that Amazon doesn’t, such as store exclusives, that way I’m not worried about the competition. Quick Tip: If there are a lot of sellers selling the same item, you might want to avoid selling it or you will have a lot of competition to deal with. The next box you will want to look at is the “Additional Information” box. This box shows a lot more information for a reseller. I’ll break it down by number. This shows the ASIN. This series of numbers and letters is used to identify it on Amazon. This is what you would use to search from an item on the FBA Calc. This shows how many reviews the item has received and how many stars people gave it. If an item has a lot of bad reviews, you’re likely to have a lot of returns. If an item has very few or no reviews, the item will be harder to sell. This is the best sellers rank. The lower the rank the better. I usually only sell items with a rank of 50,000 or better. If there is no rank listed, check the sales rank section of CamelCamelCamel. This is the weight of the item. This is important, because the heavier the item the more expensive it will be to ship. I usually plan on $5 to ship items 1-3lbs, $6 to ship 4-10lbs, $7 to ship 11-20lbs, and $8 to ship 21lbs-30lbs. Amazon offers greatly discounted UPS rates, when sending them FBA products. 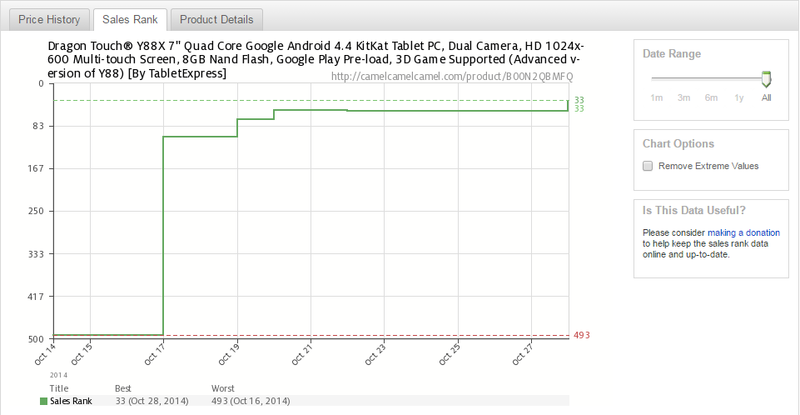 This shows when the product was first available. This is important for electronics and items that see new iterations often. For example, if a new model comes out for the item you’re selling, chances are you’ll need to drop the price. I cover sourcing much more in-depth here, if you’re interested in learning more. Reselling is not for everybody, so please don’t rush into it without researching, or you may end up losing money. If I’ve sparked your interest, please check out my other reselling guides.